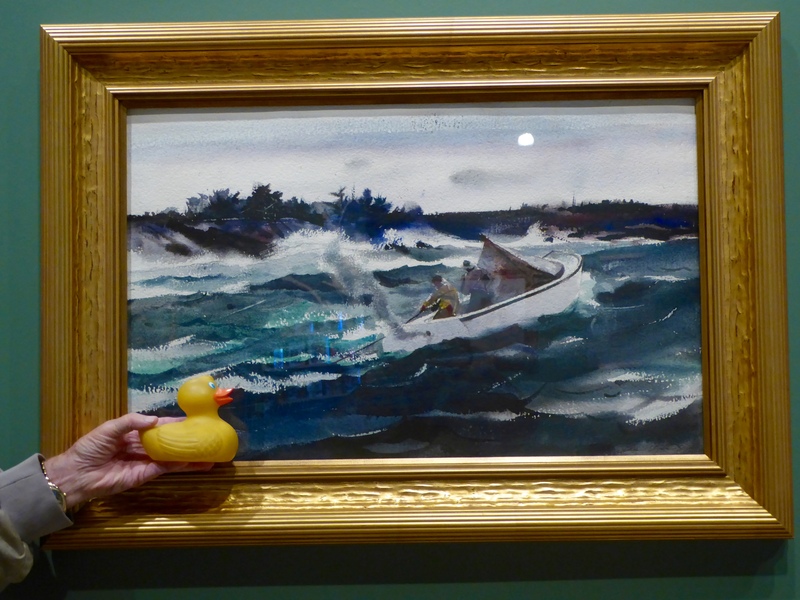 This week, my little friend, Lagertha Duck and I, Zeb the Duck, returned to the Denver Art Museum. Lagertha Duck is named for a Viking Warrior Queen. Great name, Lagertha! This museum has so many interesting permanent exhibits, and they have really great temporary exhibits. 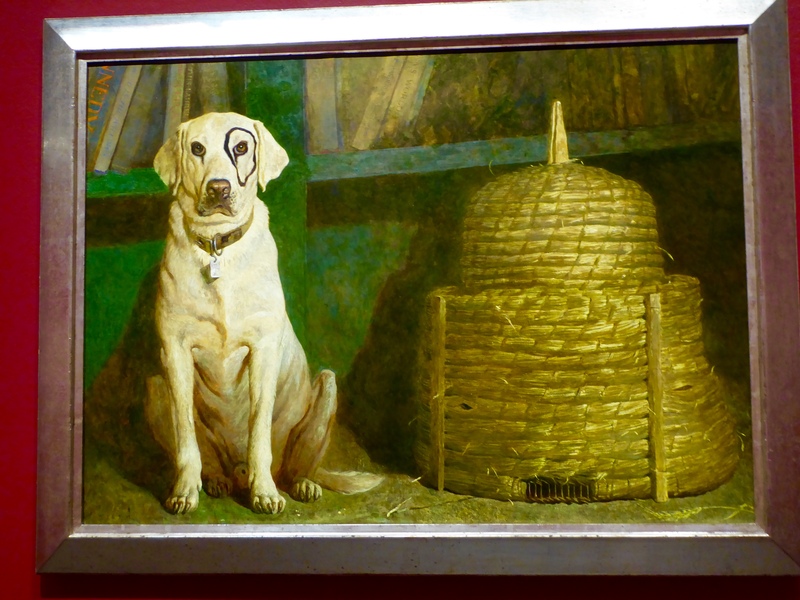 Let’s go to the special Wyeth exhibit now. This exhibit will be in Denver through February 7. 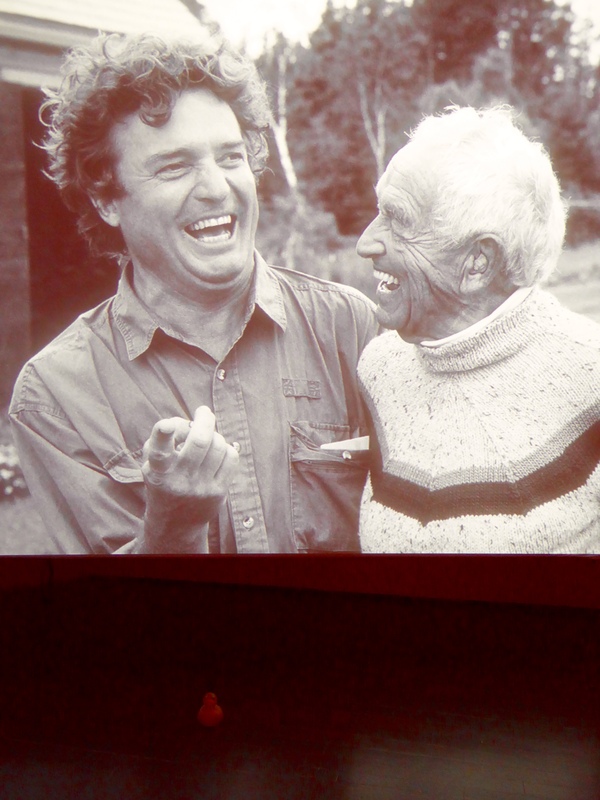 This features Andrew Wyeth (1917-2009) and Andrew’s son, Jamie Wyeth (born 1946). They are both famous and talented artists. Here they are, father and son. I loved this painting when Jamie was a young child, painted by his famous father. Portrait of Jamie Wyeth as a child. 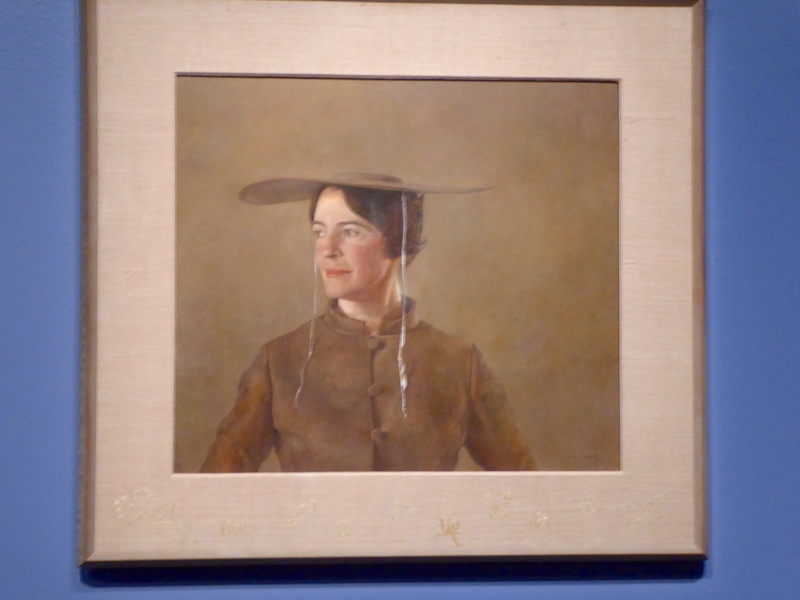 Painted by Andrew Wyeth, his father. Even at a very early age Jamie wanted to draw. The scribbles at the bottom were done by Jamie. This is Christina Olson. She was a friend and frequent subject of Andrew’s paintings. Andrew completed this in 1947. 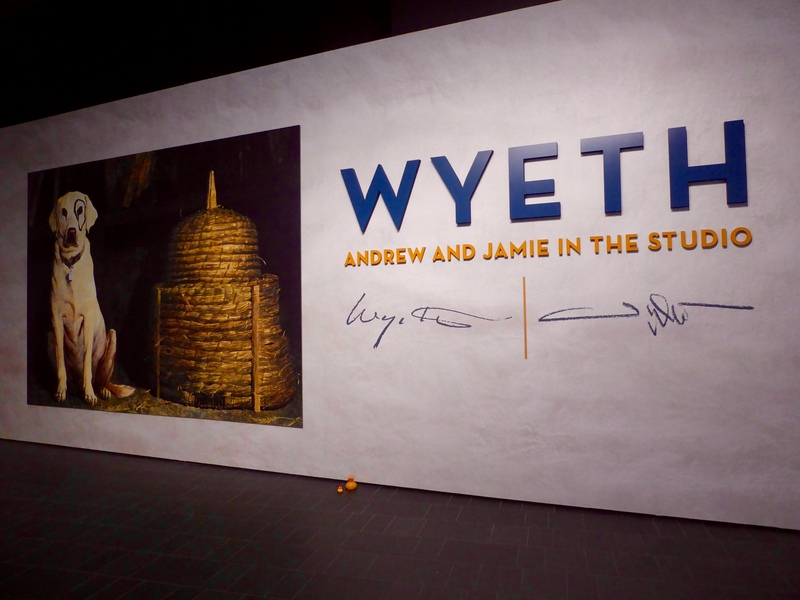 At one time Jamie Wyeth had a place in Andy’s Warhol’s New York studio. 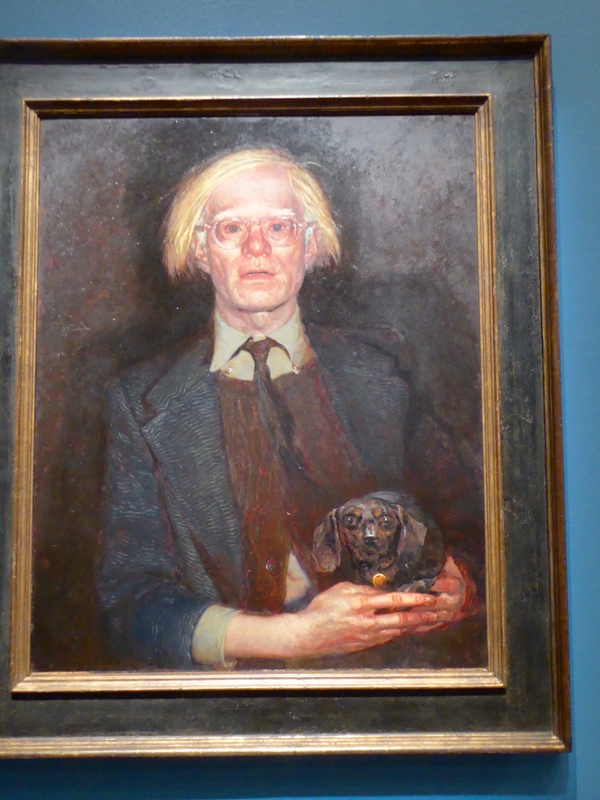 During this time, in 1976 Jamie painted Andy Warhol. Andy is holding is dog, Archie. Here is a painting by Andrew, finished in 1943, called The Hunter. Both Andrew and Jamie really wanted to know their subject and the area well before they painted. 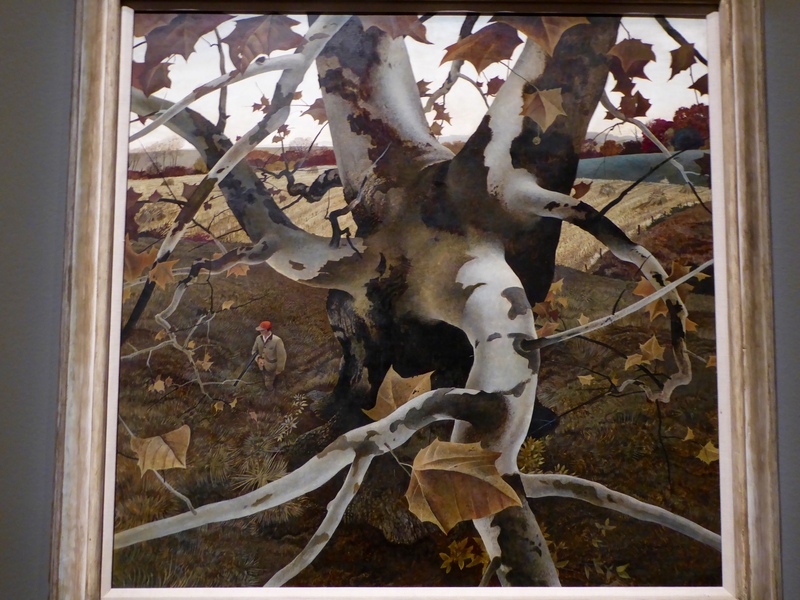 Both of the Wyeth’s spent summers in Maine and the rest of the year in Pennsylvania. Included with our entrance ticket to the Wyeth exhibit, was an audio guide. We enjoyed the audio comments by Jamie Wyeth. 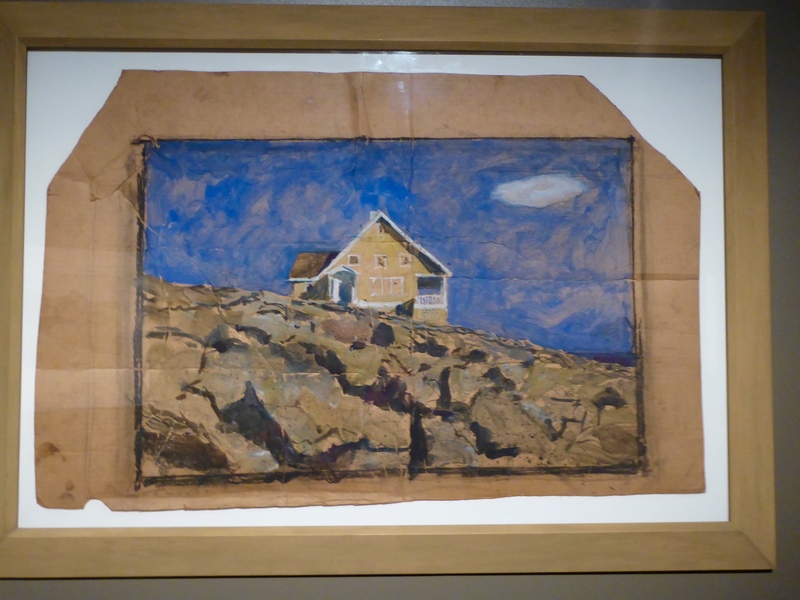 This painting of the Kent House, by Jamie in 1972, was painted from inside a bait box. The house painting is oil on cardboard. 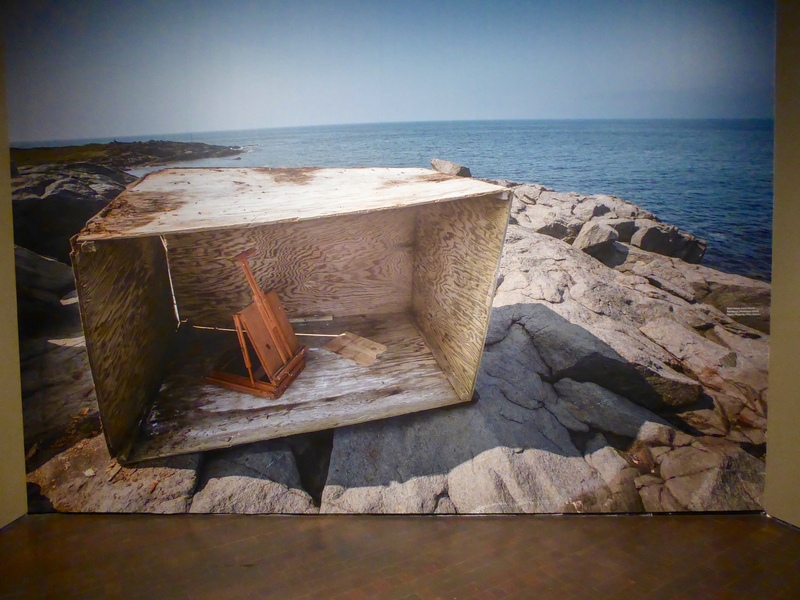 The audio guide said Jamie did not want to be observed while he painted, so he borrowed this bait box from a fisherman, sat inside, and painted the Kent House on the hill. Jamie says he never really painted the sea. 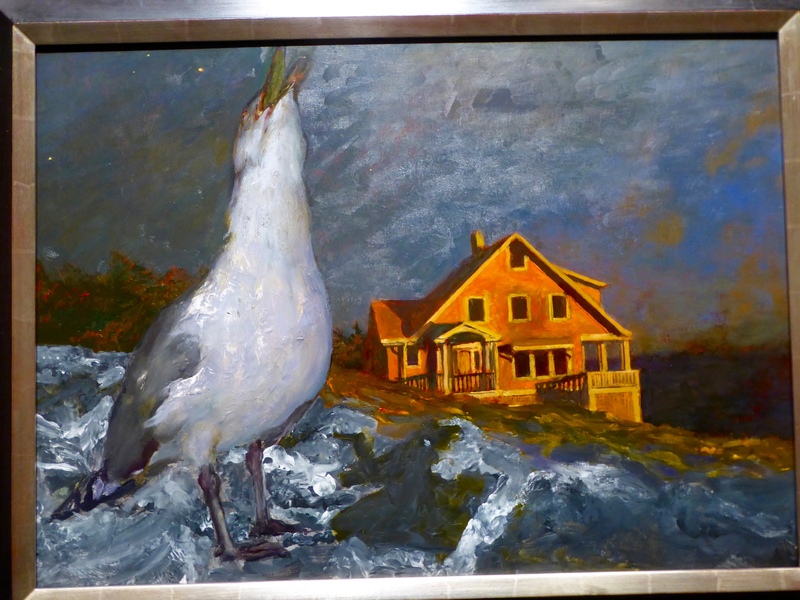 The sea is “more interesting when it’s reflected in a gull or sheep that lives the island” This painting in 2008, named Jenny Whibley Sings, is oil on board. In the background is Jamie’s home and studio in Maine. 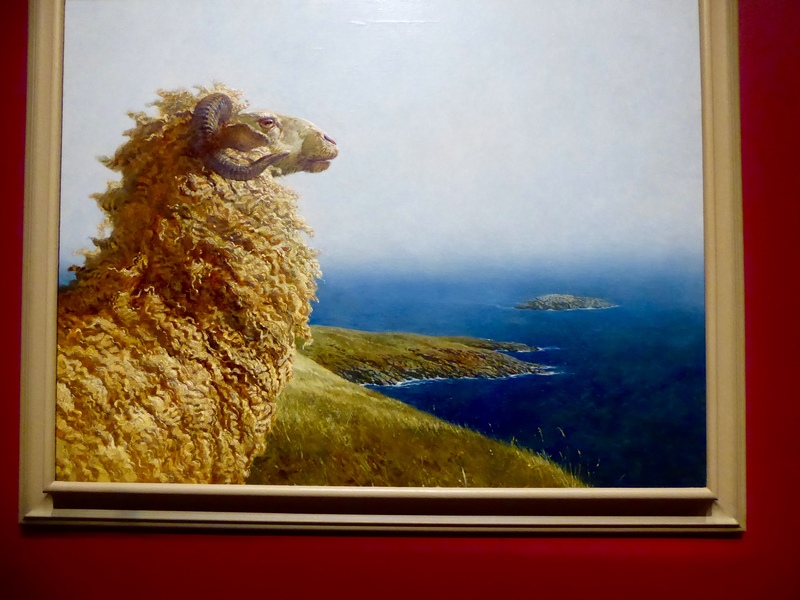 Here is The Islander, with the sheep, painted in 1975 with oil on canvas. Meet Kleberg. He is Jamie’s dog. This is an oil painting on canvas and completed in 1984. Notice the unusual making around Kleberg’s eye. Kleberg was getting too close to the easel while Jamie was painting one day, so impulsively, Jamie put his finger in the black paint and painted Kleberg. The marking was so popular with humans, so Jamie repainted it about once a week. You will laugh as you hear Jamie tell the story on the audio guide. Jaime has another funny story about painting this Raven. In the spring of 1980 he had a cow carcass delivered to his island. The neighbors noticed. 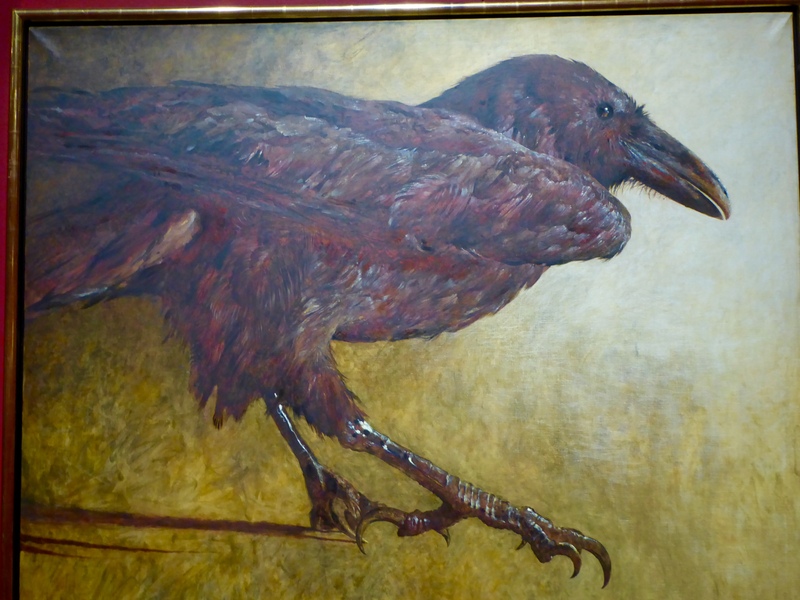 The dead animal attracted the raven so Jaime could paint him. Betsy is Andrew’s wife and Jamie’s mother. Andrew completed this painting of his wife, Betsy. Betsy did much of the framing for Andrew’s paintings. She did frame her portrait. Notice the embroidery on the bottom. This painting and framing are spectacular when seen in person. There are many works of art exhibited, completed by Andrew and by Jamie. We hope you visit this exhibit and enjoy the paintings. When you have seen the exhibit, we hope you stay in the museum and visit the North Building. 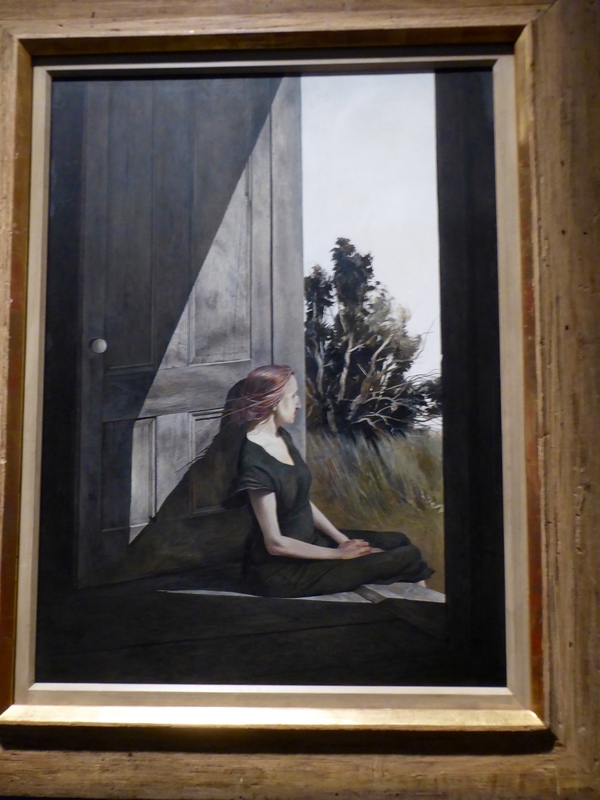 On level 6 there are a few more paintings by Andrew Wyeth. This, Rough Hauling, a watercolor completed in 1940 is my favorite. Then on level 7, you can see an illustration by N. C. Wyeth, Andrew’s father. N. C. was a very famous illustrator. His first commission as an illustrator, in 1903, was Bucking Bronco for the cover of The Saturday Evening Post. 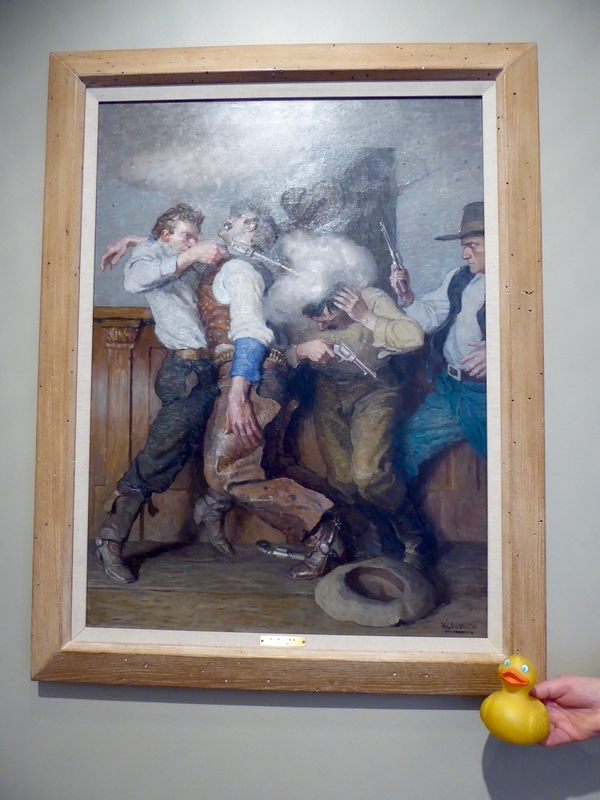 This illustration, owned by The Denver Art Museum, completed in 1916, is Gunfighter. The illustration of a saloon fight represents a larger than life version of a bygone era. 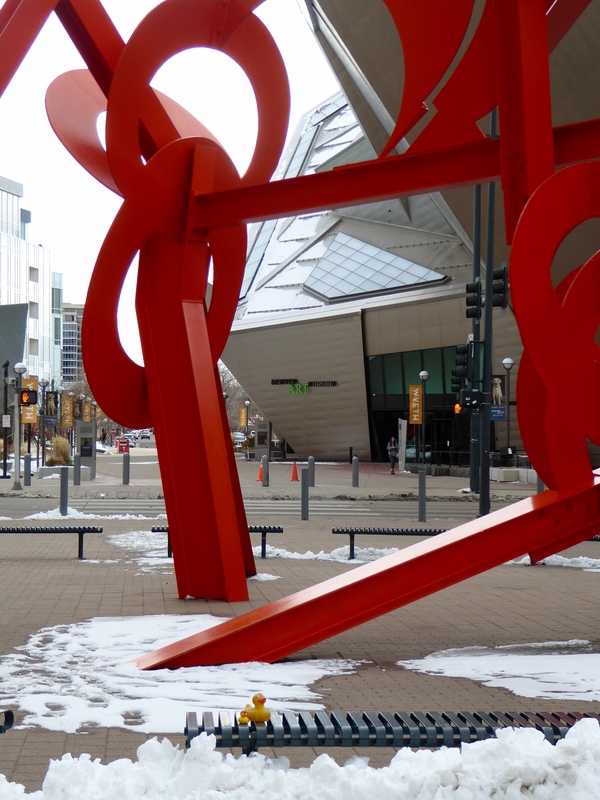 We hope you visit The Denver Art Museum soon. We like to visit here often. 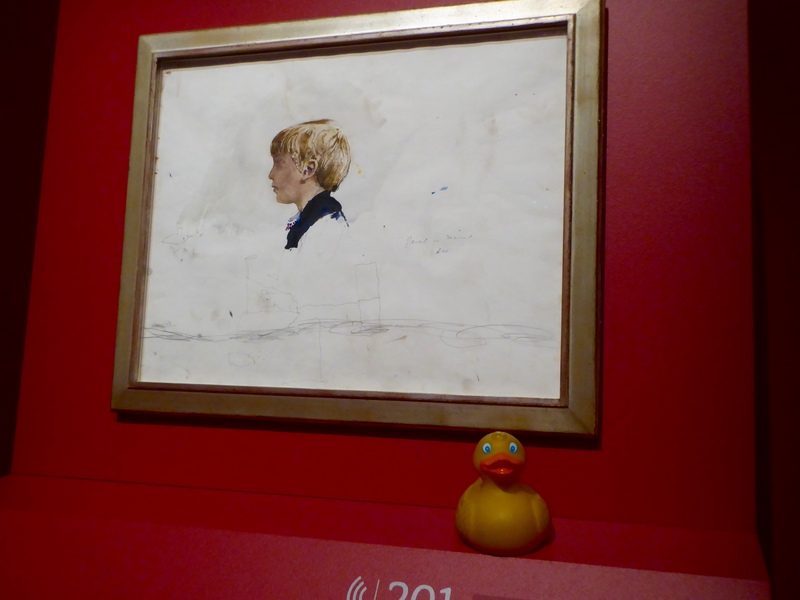 This entry was posted in Colorado, Uncategorized and tagged Andrew Wyeth, Colorado Traveling Ducks, Denver Art Museum, Jamie Wyeth, N.C. Wyeth, The Wyeth Exhibit. Bookmark the permalink.